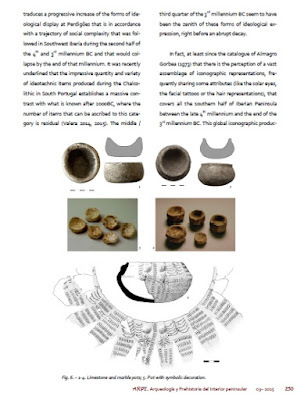 It was recently published a paper about the ideotechnic items present at Perdigões enclosure. This paper presents a preliminary approach to the global assemblage of the Late Neolithic and Chal-colithic ideotechnic items recorded in Perdigões enclosures (Reguengos de Monsaraz, Portugal). An inventory of the available data is provided. These items are organized in nineteen typological categories and are ana-lyzed in terms of raw material, context and chronology. 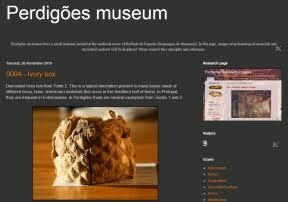 Based on the available information, some questions regarding interaction and the social role of these objects at Perdigões are discussed. António Carlos Valera, The diversity of ideotechnic objects at Perdigões enclosure: a first enventory of items and problems. ARPI, Homenaje a Rodrigo Balbín Berhmann, 3 Extra. Universidad de Alcalá, 2015: 238-256.